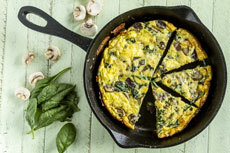 This is a fresh idea for breakfast that incorporates the bright flavors of greens with the eggs and cheese. Finishing it frittata-style, under the broiler, makes a nice change from a typical omelet or egg casserole. Heat large skillet over medium heat and add half of the oil. When oil is hot, add garlic, green onions and thyme and stir. Add spinach and cook until it wilts; add balsamic vinegar and reduce liquid by half. Turn off heat, remove cooked spinach from pan, set aside and let cool. In a large bowl, whisk the eggs and add the cooked spinach, half and half, cheese, and salt; mix thoroughly. Wipe out the skillet to remove food particles that would cause the eggs to stick. Heat the skillet on high, add remaining oil and swirl to cover entire surface; add egg mixture. Use rubber spatula to ensure eggs are not sticking to edges of pan so they can be easily removed later. Once eggs are firm, place skillet on top oven rack below broiler. Broil until browned and firm to the touch, about 5-7 minutes. Pan will be very hot, so use oven mitts and take care when removing from oven. Set aside to cool slightly, slice and serve.